Along the road at Times Square (NCL not NYC) the Manic Street Preachers pitched a tent. Here at the Globe, the Jazz Co-op was having a busy old time. Day one of a two-day weekend workshop at the Railway Street premises utilised the ground floor bar and first-floor music room. As participants departed at the end of an informative first day, in walked a Tulip. The Francis Tulip Quartet walked in…set-up, tune-up, run through, ready to go. The FTQ departed, as does any self-respecting band, in search of that pre-gig essential, fast food. Meanwhile, the FTQ fan club arrived. The hordes arrived just in time (there’s a tune in there somewhere) to see the last Red Kite depart for the sanctuary of Derwent Valley. Yes, Wylam Brewery’s ever-popular beer was no more. An Angel (another in Wylam’s portfolio) came to the rescue. Front row seats bagged (set at a distance from the stage), lights dimmed, the Globe was in a Monk’s Mood. In Walked Bud (with Francis, Joel, Michael and Matt) for starters, Let’s Call This and its swing-time feel and Michael Dunlop’s walking bass line, this was great stuff! Principal soloists, at least initially, Francis Tulip, guitar, and Joel Brown, piano, laid-down amazing solos which drew huge applause – ‘yeah!’, ‘whoo!’ and the like. Such was the level of applause that Francis Tulip’s name checks were largely inaudible. But hey, the audience knew who they were! Round Midnight took it down before a first drum feature for Matt MacKellar on Jackie-ing. MM’s intro developed into a tune-long master class with the boys in the band punctuating as and when. Most definitely an ‘I was there’ moment. Blue Monk with MacKellar’s restrained Blakey-like drive, Michael Dunlop’s assured ‘in-the-pocket’ time, Tulip and Brown in a real Thelonius mood, followed by a Monk set-closer, Green Chimneys. A first set covering TS Monk’s library spanning the Blue Note, Prestige and Riverside years, notes scribbled in pad read ‘amazing!’. And so it was. The bar was busy. Another Angel, thank you. As the second set began the first of the tent dwellers in Times Square hurried past the Globe, their gig done. One or two stopped momentarily, peering through the window, curious, no doubt wondering who was performing at this crowded Jazz Co-op gig. Francis Tulip soared 500 Hundred Miles High with another ‘beyond-his-years’ solo. Think just how good FT will be when he learns how to play! Seriously, 500 gigs later, who knows what Tulip will be capable of? A Latin feel to I’ll Remember April, Wayne Shorter’s Beauty and the Beast with bassist Dunlop utilising a couple of pedals, the FTQ demonstrated it’s more than a Monk machine. 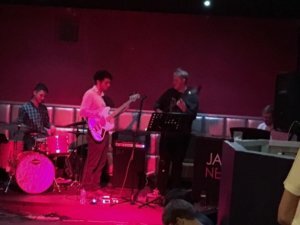 Stella by Starlight, Footprints with pianist Joel Brown making his mark, closely followed by Tulip’s stratospheric post-bop guitar playing, this debut gig by the Francis Tulip Quartet exceeded every expectation and more. To close, Tulip announced Ray Noble’s Cherokee, suggesting they would play it at a lick. Good! exclaimed your correspondent. And so they did with Matt MacKellar’s hi-hat working overtime and Joel Brown almost running out of fingers! More! More! Let’s go out on Afro Blue. Gig of the Year? It’s a contender.